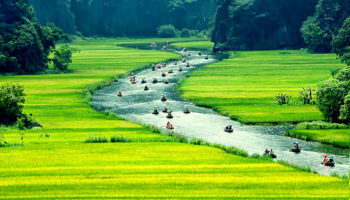 Home to nearly 100 million people, Vietnam’s rich cultural heritage is fascinating to explore. On this 10 day trip which takes you from the south to the north, you will learn loads and get to experience this amazing country at its dazzling best. Covering a huge distance and a wide range of tourist destinations, you’ll wander around amazing historic and religious sites, get to know bustling cities and, of course, taste some of Vietnam’s delicious cuisine. Some of the landscapes need to be seen to be believed, and sights such as the magnificent Ha Long Bay and the beautiful rice-fields around Hoi An will set your heart racing. With so much to see and do; this journey will leave you with unforgettable memories of a marvelous time spent exploring Vietnam. 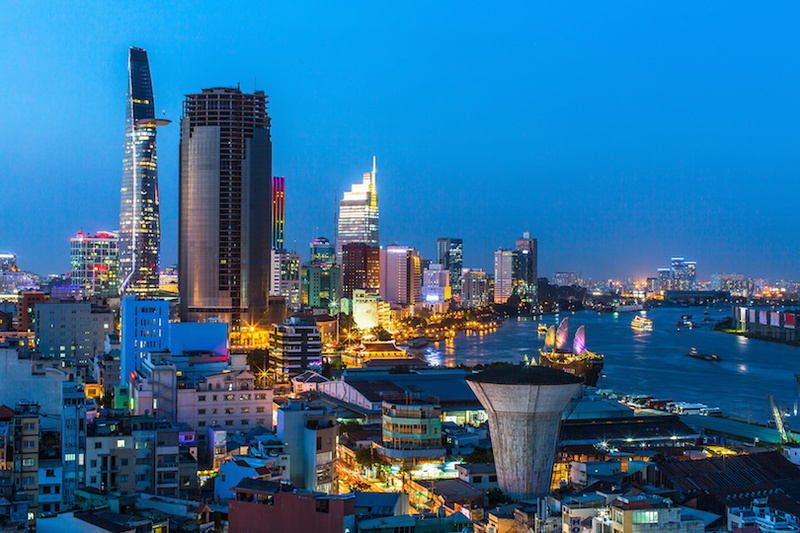 Having arrived in Ho Chi Minh City, you’ll be picked up at the airport and taken to your hotel where you can take a rest and acclimatise after your long flight. This first day of the tour is a free day so you either spend what time you have exploring Ho Chi Minh City at your own leisure or relaxing at the hotel and preparing for the exciting days ahead. Both hotel staff and your guide who greets you at the airport will be more than happy to give you any pointers on what to see and do in the city and it is an enthralling place to explore with a wealth of historic sites and cultural landmarks. 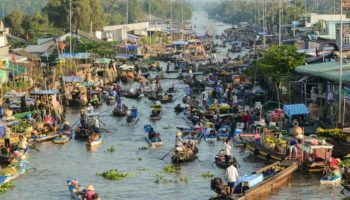 The second day begins with a two-hour drive through the countryside surrounding Ho Chi Minh City – heading to the Mekong Delta – where you’ll take a memorable cruise along the scenic waterway. 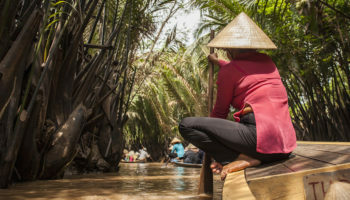 The intoxicating atmosphere and bustle about Mekong-Cai Be Floating Market is just one of the many things you can look forward to. You’ll learn how coconut candy is made and how other local products such as rice-paper and rice wine are produced. 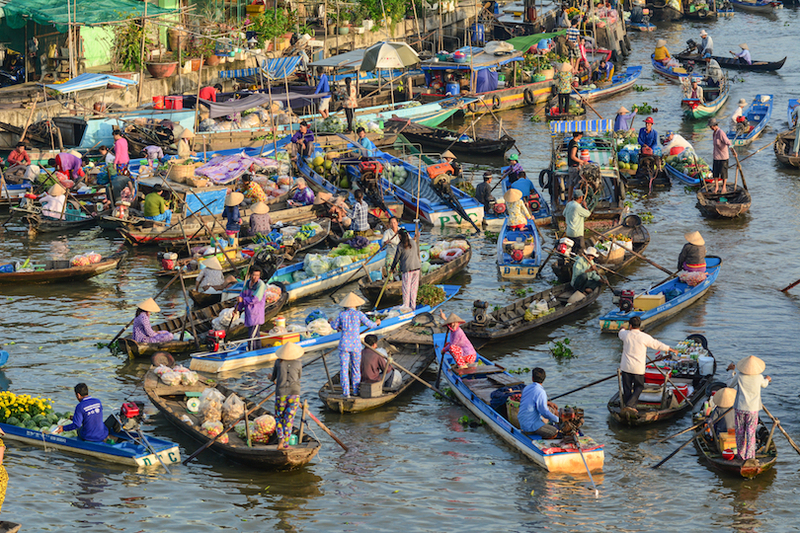 The myriad of boats laden with wares at the floating market is mesmerizing. You’ll spend time with some local farmers and learn about their lives while listening to some traditional Vietnamese music. 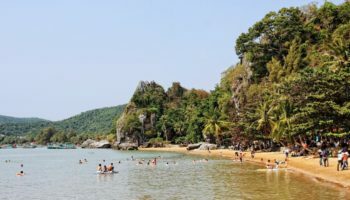 On Tan Phong Islet, your guide will introduce you to some delicious tropical fruits and you’ll be welcomed into one of your new friend’s homes for a sumptuous lunch of ‘Elephant Ear Fish’ – a local delicacy. On the trip back to Ho Chi Minh City, you’ll be tired but happy with all that you’ve seen and done. In the evening, you can enjoy a scrumptious meal at your hotel or head out and explore the city’s nightlife. 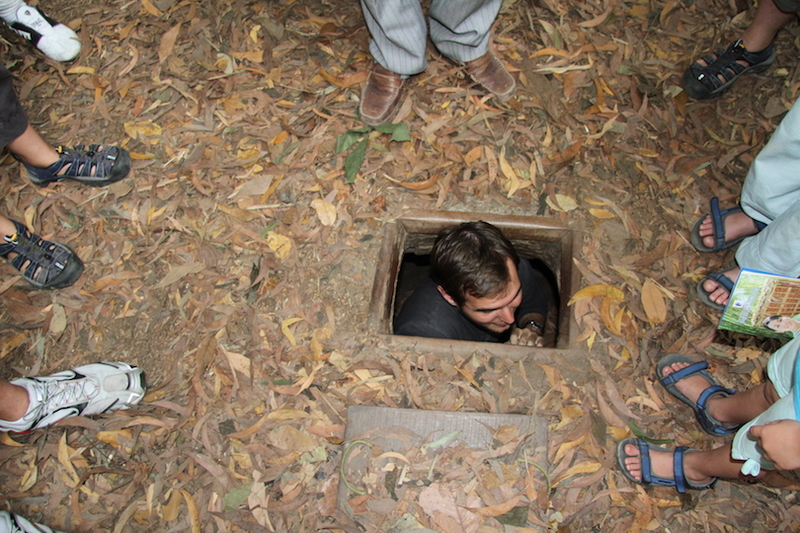 After enjoying a lovely breakfast at your hotel, it’s time to head to the stupendous Cu Chi tunnel complex and learn all about how the Viet Cong lived in the tunnels and used them as a military base. 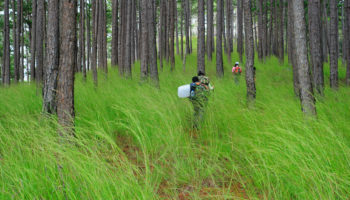 The huge network of interconnecting tunnels is fascinating to explore; your guide will tell you all about the history of the Cu Chi underground tunnels and the Viet Cong’s resistance against the American forces. The tunnels stretch 121 kilometers in total and are now a very popular tourist attraction; they have been well-preserved and you can even crawl around some of them if you feel so inclined (not recommended for the claustrophobic). After visiting this interesting historic site, it’s time to taste some delicious Vietnamese cuisine at a local restaurant before heading to the airport for your flight to the next leg of your tour – Da Nang. Upon arrival, you’ll be picked up and taken to your hotel to you relax and enjoy a delightful dinner. Day four of your tour from the south to the north of Vietnam starts with an unforgettable visit to the My Son Sanctuary, which will surely live long in the memory. 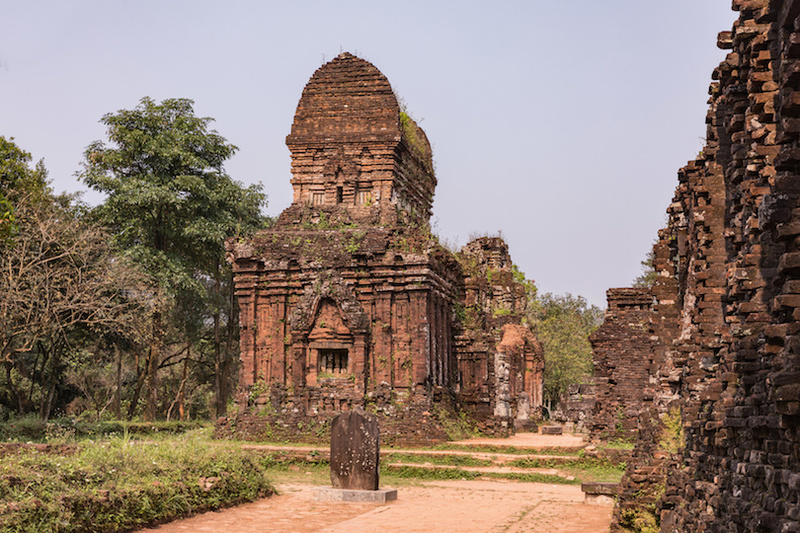 Built between the 4th and 13th centuries, the tower-temple complex is incredible to behold and the stunning archaeological ruins are mesmerizing to wander around. Formerly a sanctuary of Hinduism, the temples are surrounded by a ring of mountains; your guide will tell you all about the history and how its fortunes dwindled over the years. Once the political capital of the Champa Kingdom, the wonderful architecture of the tower-temples attests to the importance of the site and is not to be missed. In the afternoon, you have free time to either relax at the hotel or explore Da Nang at your leisure. 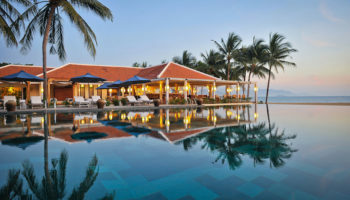 After breakfast at your hotel, the tour heads onwards from Da Nang to Hoi An. Here, you can have Ann Tailor make you a complementary tailor-made piece of clothing (something which Vietnam and Hoi An, in particular, is known for). The afternoon offers up yet more delights as you tour around the picturesque historic center of Hoi An on foot. The Old Town is full of delightful architecture and the riverfront is particularly lovely to walk along. 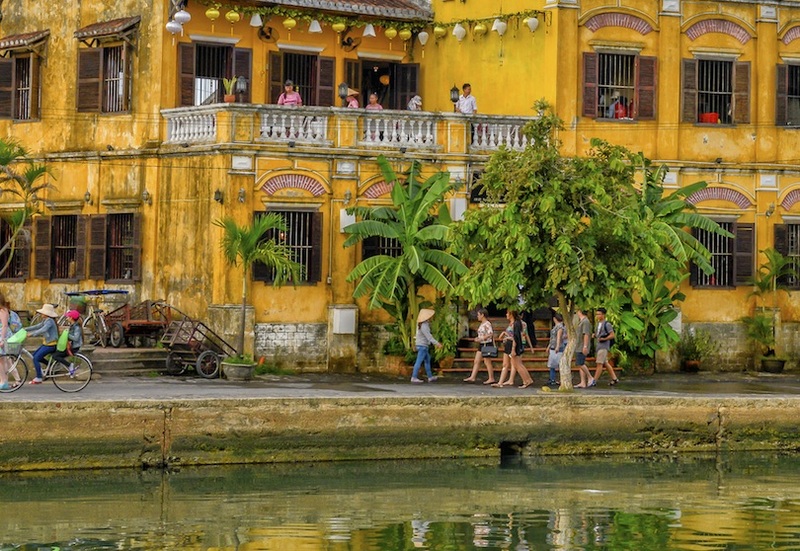 Hoi An has been an important trading port for much of its history. Your guide will take you around all the major sights and it is well worth stopping off to try some delicious local cuisine which Hoi An is renowned for. 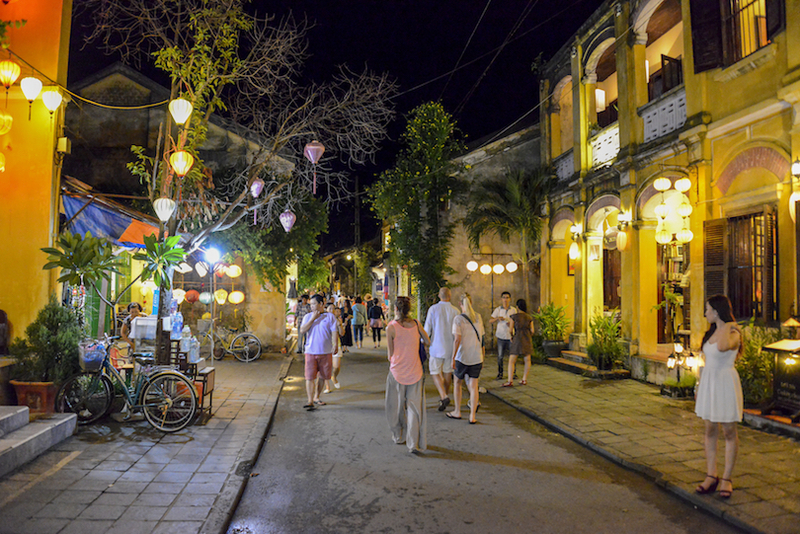 After a busy day sightseeing, enjoy dinner at your hotel or wander off into the heart of the city to explore yet more of what Hoi An has to offer. Perfect for foodies, this day of the tour will see you try loads of local delicacies as you explore Hoi An’s verdant countryside by bicycle. Cycling past endless rice-paddies – which look so beautiful with the sun glinting off them – you’ll stop at a local village to try Cao Lau – a traditional specialty from the area. In the village, learn how to make White Rose; you’ll certainly want to make these delicious dumplings again when you return home after the tour. After an enjoyable time making new friends and learning about Hoi An’s rich culinary history, it’s time to cycle on to Cam Nam, where you have yet more treats awaiting you. Here, you’ll sample Yin and Yang foods and learn how the different ingredients create a harmonizing balance that soothes your soul. 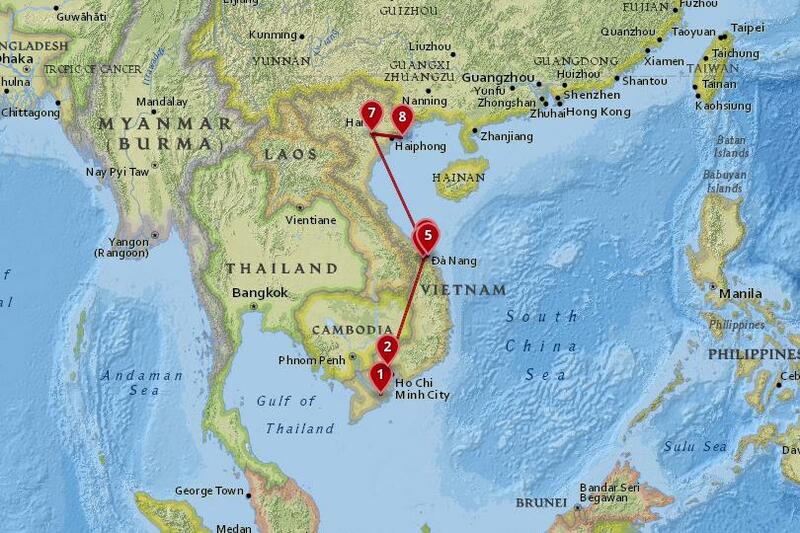 After a delicious breakfast at the hotel, it’s time to leave Hoi An and take a flight from Da Nang to Hanoi. 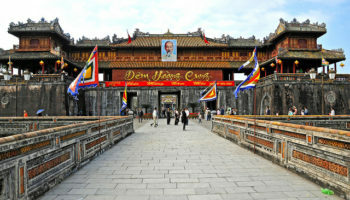 The capital of Vietnam is a bustling place, full of life and energy. 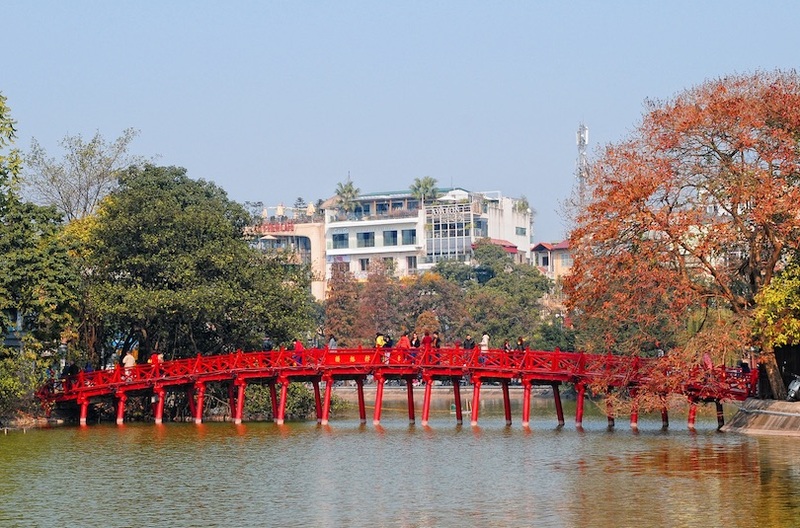 Your guide will take you around some of its most famous sights, such as the peaceful Temple of Literature, the wonderful Huc Bridge over Hoan Kiem Lake, and the historic Jade Mountain Temple. Hanoi has often been called ‘the Paris of the East’ because of all of the beautiful colonial-era buildings dating back to when the French ruled Vietnam. 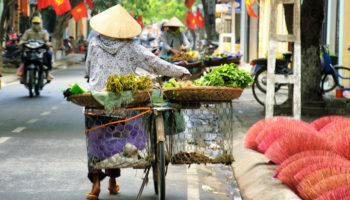 After enjoying a delicious lunch, the sightseeing continues as you take a cyclo or pedicab as it is also known around Hanoi’s ancient town which is so intoxicating to explore. 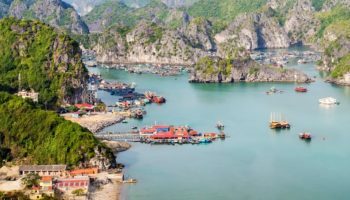 From Hanoi, a shuttle bus will take you past some lovely scenery until you reach one of the must-see sights in Vietnam – the stupendous Ha Long Bay. One of the most popular tourist destinations in the whole country, the huge bay boasts over 1,600 limestone islands that rise up out of the water; the views are simply breathtaking. Grottoes and caves litter this unique and special landscape and cruising around the beautiful emerald waters will live long in the memory. 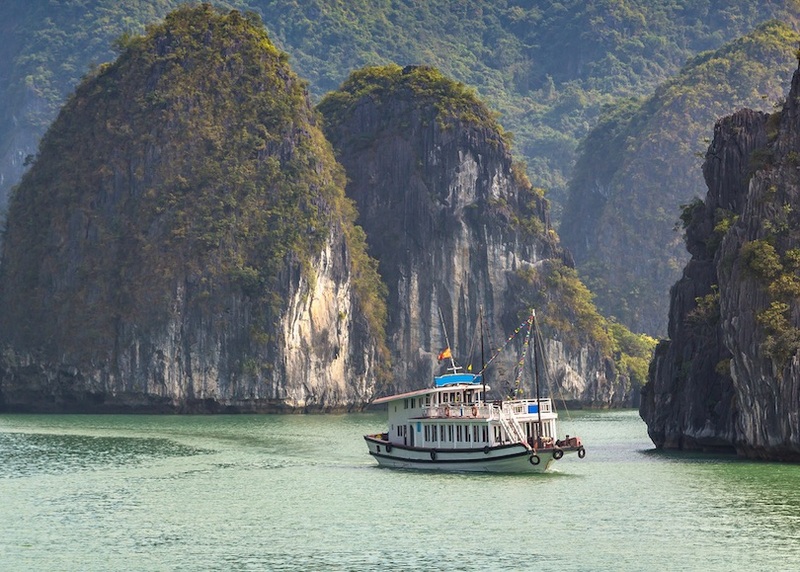 Ha Long Bay needs to be seen to be believed such is the beauty on show. Overnighting on the Junk Cruise will enable you to make the most of this unforgettable experience. 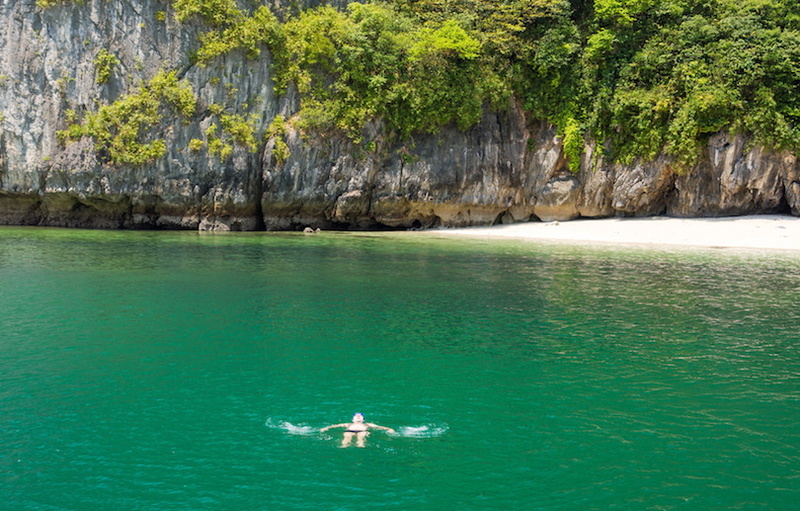 After a lovely breakfast aboard the boat, take to Ha Long Bay’s welcoming waters for a swim before drying off and basking in the sun. 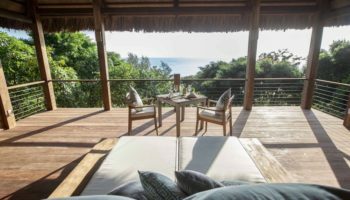 Sunbathing on deck is a great way to relax after the days of sightseeing; the scenery will make you want to stay there forever. After eating a lunch with Vietnamese specialties such as Banh Canh, Pho and Banh Ran, the tour will take you back to Hanoi where you can relax further or spend your evening exploring the city. Once you have breakfasted, it is sadly time for the tour to come to an end and for everyone to head their separate ways. 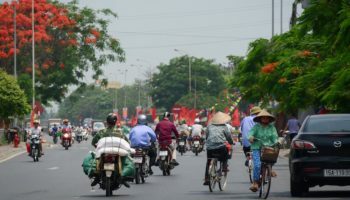 While for many guests this final day of the tour is the last day of their holiday in Vietnam, you can also stay longer to explore the rest of what Hanoi and Vietnam has to offer. 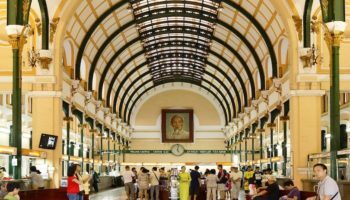 Whether you need a transfer to the airport or are looking for tips on what to see and do in Hanoi, the team will help you out with anything you need and to make sure you have made the most of your time in Vietnam.